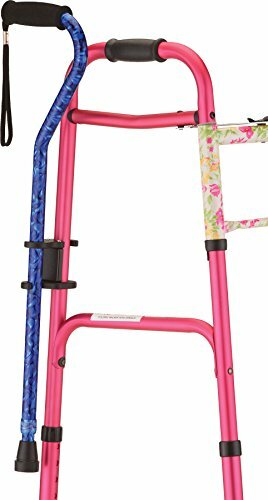 If you are a senior with issues getting around, having a proper walking cane can be the difference between going wherever you want whenever you want and being stuck at home. What happens if having a standard cane is not enough, and you require additional assistance so you can feel comfortable on long walks and trips? In this article, we take a look at the best cane accessories that will make your life a lot easier. 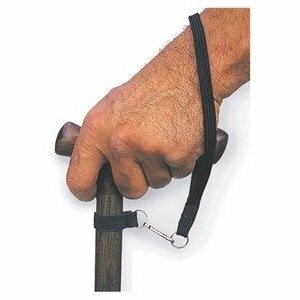 These wrist straps are a useful tool to prevent you from losing your cane or having it fall away from you when you need it. Cane straps are useful for seniors because they help prevent you from dropping your cane when you are trying to do something else. These straps are good for wrapping around the cane and your wrist. Once the strap is wrapped around your wrist, you can reach into your purse or try to hand something to someone without having to worry about dropping your cane. Using a strap around the cane and your wrist also prevents you from leaving the cane somewhere and forgetting about it if you do not entirely rely on it. These straps work exactly as you would expect them to. They are not difficult to pull over the cane, and they can be taken off quickly as well. The strap is durable and bonded well to the piece that holds it onto the cane. This rubber quad tip provides needed support and shock absorption to help you walk longer distances. Lightweight and sturdy rubber tip suitable for most 3/4''and 7/8" cane shafts. Not to be used with folding canes. Enhances user stability, and reduces fatigue associated with stress impact to hand and wrist. Four-tier design allows for better traction. The quad support is used to do a variety of things that are very useful. The quad base prevents the cane from tipping over and allows it to stand on its own. In addition to that, it also provides additional support to the user because the quad corners are flexible, allowing you to walk with more comfort. Since this item is rubber, it also helps with traction control, so you do not have to worry about slipping on ice or water when you are walking. Also, because the rubber is flexible it moves a little bit when you plant the cane on the ground that takes excess shock off of the wrists and arms so you can walk longer without as much fatigue. This ice grip attachment is an interesting tool that is highly useful for traveling outdoors in adverse winter conditions. This is a fresh product because it is unlike many things you see out there right now. 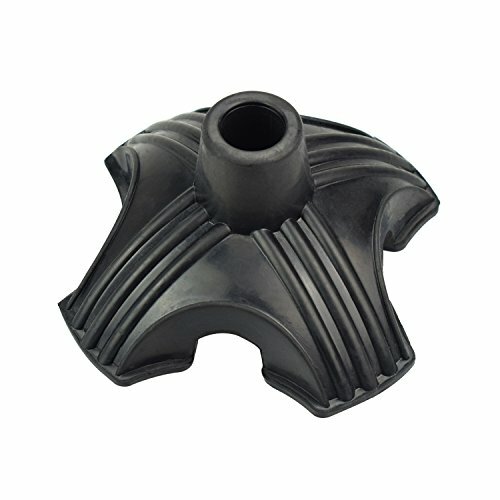 This cane attachment is designed to go over the existing shaft on your cane and cover over the base. With this attachment the base of your cane becomes capable of digging into snow and ice to help prevent slipping and falling. This drastically improves stability in rough conditions and gives you peace of mind so you can go outside even in adverse conditions and live your life. This tool makes using a cane and rollator much easier because you do not have to worry about carrying both at the same time. SNAPS ON IN SECONDS with no tools required. Made of durable, unbreakable plastic. SO EASY TO TAKE ON AND OFF YOUR CANE from your walker or rollator with your cane at hand's reach. ATTACHES TO THE SIDE to keep your walking cane and walker/rollator streamlined. If you use a rollator or a walker, you may not need it for everything, and you may use a cane as well to increase your mobility and allow you to go to certain places that don’t allow walkers or rollators. You cannot hold onto a cane while you are using your walker, so you need something to keep it in place when you are not using it. This is where rollator cane holders come in. 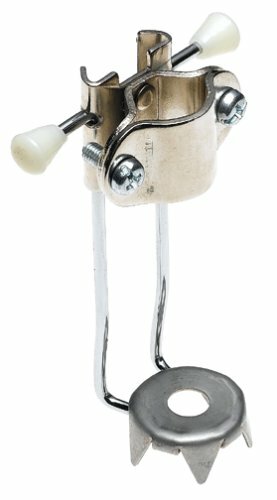 This cane holder snaps quickly to any walker and holds any ⅞ shaft cane. Using this is a great way to increase your freedom and accessibility to go anywhere you want. That is ultimately what these products are here to do. This cane holder frees up your hands so you can do more of the things you want to do. This flashlight is useful in emergencies as well as late night bathroom trips. No more worrying about falling in the dark. Your mobility and accessibility shouldn’t be limited to day time or well-lit areas. A good flashlight can help you walk through the dark or illuminate dimly-lit areas so you can see where you’re walking. 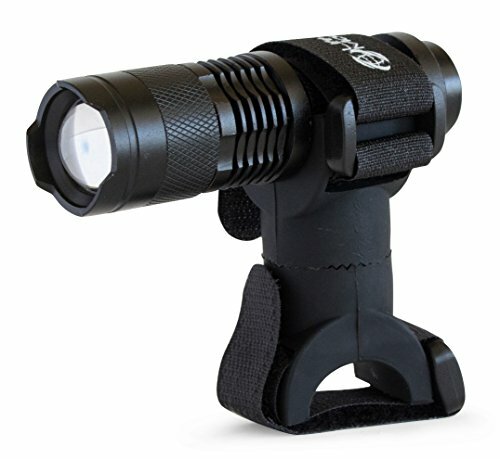 This flashlight hooks easily to any cane and comes with a 300 lumen LED light powered by one AA battery. The flashlight itself is fully adjustable and rotates 360 degrees to allow you to see in whatever direction you want. The straps that come with it are also fully adjustable and comfortable to hook and unhook. This is incredibly useful in the event of an emergency. You won’t have to walk in the dark to find a flashlight because you have one attached to your walker or cane. Having a flashlight attachment on your cane can be a great help when you need it most. This cane holder allows you to hook your cane to countertops and tables while you use your hands to do something else. 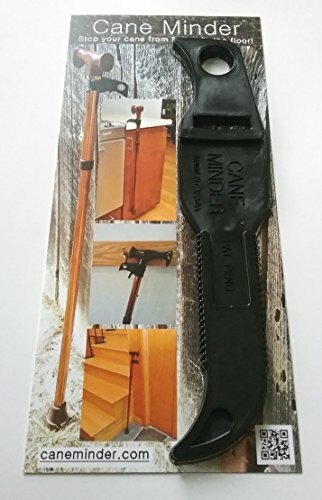 This cane holder allows you to mount your cane on the corner of a countertop or piece of furniture until you need it again. This device prevents you from losing your cane or from it falling over when you’d like to put it down. It's useful for people who are very reliant on their cane or only somewhat reliant. If you need to reach into your purse to get money out at a restaurant, you can set the cane on the corner of the counter while you get the cash and you have the cane right in front of you when you get done. This light attachment helps illuminate your path by shining whenever the tip of the cane contacts the ground. The batteries are non-replaceable and it isn’t apparent if they can be re-charged. 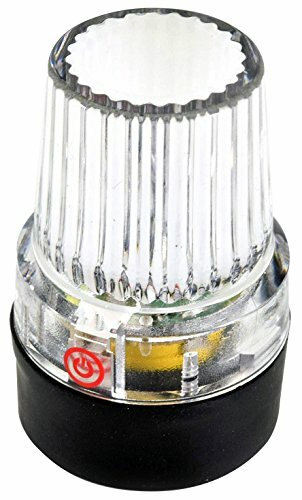 For any senior who likes to walk outside at sunset, in the early mornings when it’s not quite bright enough or even just walking around in low lit areas like a movie theatre, this LED cane tip is a great attachment. The flashing light shines every time the cane touches the ground, so this is incredibly useful if you are walking outside near the road at night. This works similarly to a reflective vest. The light also has a broad base on it which serves as a stabilizer to help keep you steady as you’re walking. To turn the light off, there is a button right above the rubber that you can touch so that it’s not always on. This saves you from feeling like you need to remove it whenever you don’t want to use it. The light is also very durable and can even be used in all types of weather. It has an excellent seal, so you won’t have to worry about any water getting inside. It also comes with non-replaceable batteries that have a one-year life cycle. There are many accessories for canes on the market today. You may already have an idea of what kind of tool you want to get for your cane, but we want to help make that decision even more manageable by breaking everything down into features and utility. If you find yourself having to bend over and pick up your cane a lot, then this could be a useful accessory for you. These straps ensure that you do not drop your cane because it gets wrapped around your wrist. Also, if you are not highly reliant on your cane, you may lean it up against something and leave it there. If you’ve ever forgotten your cane somewhere after putting it down, you’ll benefit from having it close to you and wrapped around your wrist. If you have ever fallen due to your cane slipping out from underneath you, then you know how important it can be to have solid support underneath you. If you walk slower or more carefully because you are afraid of falling, then you may benefit from some additional support and stability. Having a quad-tipped cane also helps you to walk on rough terrain, and it absorbs some of the shocks that come from walking on hard surfaces. This will not only help you fatigue slower on that specific walk, but it will help ease pain and soreness over the long term. Maybe walking with your cane is not an issue at all. You might need somewhere to put the cane when you do not need it. That is where cane holders come into play. If you use a walker and a cane, but you do not need both of them all the time, then having a holder is a good purchase for you. Cane holders can hook right on to your walker and keep your cane from falling over while you are using the walker. This is also useful if you are walking long distances to places where you cannot access with a walker. This holder allows you to take the walker there but use the cane when you have to. If you have ever been stuck in the middle of the night or during a power outage without a light because you did not keep a flashlight near you, you know how scary it can be. If you have a light hooked right up to your cane or walker you can turn it on and do whatever you have to do without worrying. This not only gives you peace of mind, but it keeps you safe when you need it most. Now that you know everything there is to know about cane accessories you should be better informed to make the right decision for you. Making the right buying choice on a cane is essential, but you want to have the right accessories to go along with it so you can live freely and independently.